Nearly 3,000 more of Oxfordshire’s most remote households and businesses will get access to high-speed broadband thanks to a £4 million boost for the Better Broadband for Oxfordshire programme. Oxfordshire County Council and BT, who are spearheading the partnership, today announced parts of Ardington, Barford St John, East Hendred, Lockinge, Lyford, Swalcliffe and many more communities will be included in the ambitious roll-out. The funding has come from cost savings made earlier in the roll-out and BT making £2.56 million available for reinvestment in the programme due to a ‘Gainshare’ mechanism in the contract, which has been triggered by strong demand for the new fibre technology from local households and businesses. 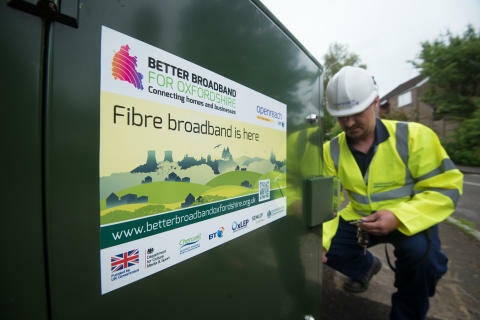 With more than 45 per cent of households and businesses already opting to use the new high speed service provided by the Better Broadband programme, Oxfordshire ranks among the best connected counties in the country. This demonstrates the high demand for good digital access, assisting economic growth, and has helped to trigger further reinvestment through the county council’s partnership with BT. Oxfordshire County Council today also emphasised its commitment to work with communities not yet able to get superfast fibre broadband through any public or private sector roll-out by launching a new scheme. In addition to the £4 million, a separate fund of up to £600,000 from programme efficiency savings has been set aside for co-funding projects where communities are willing to share the costs of the installation work. Under the scheme, the council will contribute up to £1,700 per premise*. Councillor David Bartholomew, Oxfordshire County Council cabinet member whose portfolio includes responsibility for broadband, said: “While today’s announcement is more great news for people living and working in some of the harder to reach parts of our county, we are continuing to look for cost-effective ways to reach the final four per cent of county premises not yet able to access this important service. The £38 million Better Broadband for Oxfordshire roll-out is part of the Government’s Broadband Delivery UK programme (BDUK), with additional funding from Oxfordshire Local Enterprise Partnership (OxLEP). Minister of State for Digital, Matt Hancock said: "The Government's rollout of Superfast Broadband has already reached more than 70,000 homes and business in Oxfordshire, but we know there's still more to be done. This re-investment in the Better Broadband for Oxfordshire scheme is fantastic news for the 3,000 extra premises who will now be able to get the fast and reliable broadband service they need." Steve Henderson, BT’s regional director for broadband partnerships, said: “The residents and businesses of Oxfordshire have been tremendously supportive of this programme with some of the strongest demand for fibre broadband in this country. They have been quick to recognise the huge opportunities this exciting technology offers. “Such high take-up of the service has enabled BT to make an early £2.56m ‘success dividend’ available to re-invest back into the Better Broadband for Oxfordshire programme to connect some of the hardest to reach properties. This builds on the funding BT has already contributed to the programme, alongside our own fibre broadband programme. Upgrades do not happen automatically. People who want to benefit from fibre broadband need to order it from their chosen communications provider. Because the network is being installed by Openreach – the network company which is part of BT Group - local households and businesses can choose from a wide range of companies offering competitive fibre broadband products and services. Faster fibre broadband is expected to be available in Swalcliffe, Barford St John, Lyford, East Hendred, Ardington, Lockinge from the end of next year.Updated coverage maps and further details about the Better Broadband for Oxfordshire programme are available online at www.betterbroadbandoxfordshire.org.uk .The website also has more information for communities interested in the Community Fibre Partnership programme in Oxfordshire.